This past April, Nebraska became the 32nd state to pass a law related to breast density notification. Beginning on July 24, 2017, all physicians throughout the state became required to inform their patients when a mammogram detects the presence of dense breasts. In enacting Cheri’s Law, so named after a breast cancer victim whose mammogram revealed dense breasts but who never received appropriate notification, Nebraska joined the ranks of the majority of states that have realized the seriousness of this issue and taken action to protect patients. In 2017 alone, Colorado, Iowa, Kentucky and Nebraska have all passed measures related to notification, and Florida is set to take up debate in 2018. Breast density is a critical indicator of breast cancer risk, and more and more states and physicians are taking the step of informing patients. Here’s a brief explanation of breast density, a look at the laws currently in place, and insights into what physicians and patients can do to improve care. First, a primer on what it means to have dense breasts. It’s important to realize that you won’t be able to feel the difference between dense or soft breasts in a self-examination, which means a mammogram is required in order to determine density. High breast density occurs if you have elevated levels of glandular and fibrous tissue, whereas breasts made up of more fatty tissue will be classified as soft. There’s an entire spectrum dedicated to measuring density by analyzing how much of each type of tissue is contained within the breast. One in two women have breasts that would be categorized as dense, with the likelihood of higher density increasing with age, pregnancy and genetics. Why is breast density important? Because if your breasts are extremely dense, you have a four to six times greater chance of developing breast cancer. It’s only relatively recently that the media, patients and even physicians have begun to elevate breast density to a subject of real note, particularly as it relates to cancer risk. It was Dr. Nancy Cappello who first brought nationwide attention to this subject following her own stage 3 breast cancer diagnosis in 2004. Not only did a mammogram not catch her cancer in earlier stages, but Dr. Cappello wasn’t told she had dense breasts, which could have prompted her to seek out additional diagnostics such as a breast ultrasound. She lobbied her home state of Connecticut to pass a notification law, and they eventually became the first state to do so, with others following suit over the course of the past decade. But even though there’s increasing knowledge surrounding this subject, the level of awareness and the law itself can differ dramatically on a state by state basis. In some states, the law amounts to a brief stipulation that requires physicians to tell their patients they have dense breasts, with no additional education or testing mandated. Still others require more in-depth educational information be provided, while some states, such as Connecticut, actually mandate that supplemental testing be covered by insurance so that patients can get the results they need to make educated decisions about their health. The patchwork collection of state laws means that not all patients receive the same experience. A woman in a state without any kind of notification law may never even find out if she has dense breasts, while a woman in a state with carefully delineated legal guidelines will immediately be referred for an ultrasound and any additional treatment deemed necessary. Nebraska and many other states have taken an important step in making notification mandatory, but as you can see, there’s still a lot of work to be done. With no immediate federal legislation forthcoming, patients and care teams each have a part to play to improve women’s health. For patients, the best thing you can do is educate yourself. Look up your state’s laws in regard to breast density and look more closely at your own mammogram results. it’s important to have a conversation with your physician about breast density, particularly in relation to your own wellbeing. Physicians and other members of the care team can also do their part. Like patients, it’s important to find out what the law is in your area. Even in those parts of the country where informing a patient about their breast density isn’t a requirement, or where the bare minimum is allowed, there’s far more you can do to help. Make breast density a regular topic of conversation with your patients. If they have dense breasts, explain what that means for their breast cancer risk and refer them for additional testing as necessary. You have multiple options when it comes to diagnosing breast cancer in patients with dense breasts. 3D Mammography, or tomosynthesis, can provide for more accurate diagnoses regardless of breast density, something that standard 2D mammography isn’t capable of. 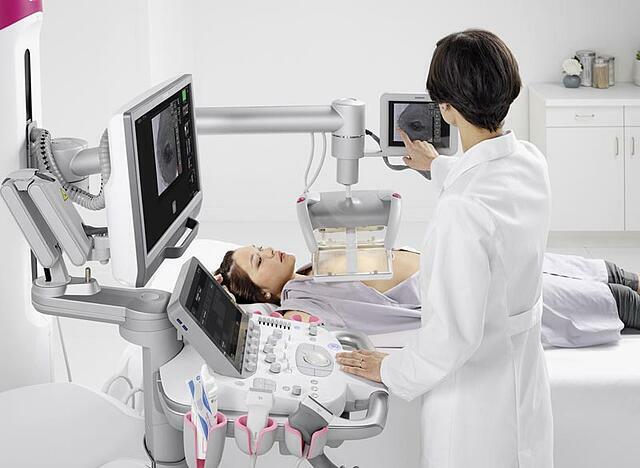 Or, if a mammography is inconclusive, a 3D ultrasound using an Automated Breast Volume Scanner can provide accurate results in its place. It’s time to demystify the subject of breast tissue. Find out what the law means for your state, then do your part to provide patients with peace of mind. Find out more about the many options for addressing women’s health issues, including breast density.